Our reader Ms. Seema Niravadhi has written to the HRD Minister Kapil Sibal against his proposal to discontinue the use of Devanagari numerals in Education as reported by the Sunday Guardian few months back. Namaste, This is regarding your highly controversial and offensive decision to intentionally dismantle the use of Devnagri numerals and enforce English numerals in Indian schools and colleges that has come as an utmost shock and caused grave distress to me and my family. We came to know about your ill-advised proposal through an article "Devanagari numbers thrown out by ministry" which has appeared in The Sunday Guardian. The aforementioned article is attached to this email in PDF format. Mr. Sibal, we are appalled by the actions of your Ministry, which rather than focusing on researching about our rich past and heritage, is instead busy in disinheriting whatever is left of our oldest civilization and its essence. Even other Ministries in the current Government have similar truculent attitude. On ९ August २००८, the then Finance Minister P Chidambaram asked college graduates to give importance to English over Hindi. Such misplaced priorities of our Government is of grave concern for us Indian people. In the blind pursuit of fictitious modernity, how can we as a nation afford to divest our tens of thousands of years old language and its attributes. As if global misappropriation of Roman Numerals as derivation of "Arabic Numeral" rather than "Devnagri Numerals" is not enough, that now MHRD wants to also deny the pride and knowledge of writing in Devnagri to our current and future generations. We, the Bharatvaasis, are proud of our Unity in Diversity including different languages. But we should never forget that if there is one common thread that ties and unites most of the Indian languages, it is Devnagri Lipi and Sanskrit. Irrespective of what region, religion or caste we come from, Sanskrit is considered the mother of almost all languages. Sanskrit and Devnagri have been, for over २०००० years, the common sutradhaar that has brought Indian people together. Nevertheless, this does not deny equal importance of other Bharatiya languages. In fact, Sanskrit as a sutradhaar brings all Bharatiya languages to same par. 1. It shall be the duty of the Union to promote the spread of Hindi and to develop the language so as to serve as a medium of expression for all the elements of the composite culture of India and to secure its enrichment by assimilating the forms, style and expressions used in the other languages of India and drawing wherever necessary or desirable for its vocabulary primarily on Sanskrit. 2. It shall be the duty of the Union to promote the use, of the Devanagari script throughout the territory of India. The whole world from China to Italy, from Japan to Mexico takes pride in home grown indigenous languages. And each country gives primary importance to their own language, unfortunately except Bharat. When Israel was founded, the first thing they did was to start a University for promotion of Hebrew. Just look at २००८ Olympics in China. At the opening ceremony, the Chinese Premier spoke in Chinese, their countdown was in Chinese numeral characters, they displayed only Chinese culture during the first २ out of ३ hours ceremony, and even their public service messages including the motto "One world, One dream" were in Chinese. An interesting fact, which allot of us don't even know, is that unlike aboriginal languages and Devnagri Lipi from Indian Sub-Continent, Chinese and most East Asian languages in their traditional form do not even have indigenous linguistic numeral characters. This is precisely why East Asians have to use Roman numerals, for example on Korean language based TV shows, Airports, and Stock markets. Despite the fact that Chinese didn't inherit any autochthonous numerals, still they created their own numeral characters based on their scripts when they reformed traditional Chinese language. China has been aggressively promoting the use of their own numeral system as evident from its use during the Olympic countdown. This is how much they primarily love their language and thereafter use English as secondary tool to take over the world. But unfortunately, your Ministry and Government of India is doing theopposite by desisting and discouraging the use of Devnagri numeralsrather than censoring and censuring the use of misnomers like Arabic numerals. Especially when there has been extensive research and subsequently countless BBC documentaries, which prove that Arabs never invented the number system. Rather, in fact, Persians learnt numerals from Bharatiya people, morphed them into Arabic script for themselves, and British misattributed them as Arabic numerals because British came in contact with Persians-Arabs first. I can bet you that even a second grader can tell you just by looking at aforementioned numerals as to what number system stands a higher chance of being evolved out of another. But unfortunately history of Devnagri Numerals is still taught incorrectly in NCERT books as Arabic Numerals. How self-demeaning are we? Mr. Sibal, our objection today is not based on some triviality of one language versus the other. This is not about anti-English sentiment because we are all mature enough to realize that it is not a zero sum game i.e. pro-Devnagri is NOT equal to anti-English. It is only about giving the most ancient language and script (Devnagri Lipi) in the world its rightful place of honour in the country of its origin. 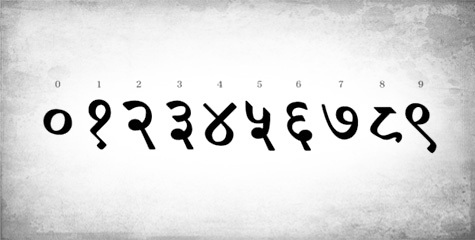 The argument that no one uses these numerals these days does not stand because when the Government itself is choosing not to follow what our Founding Fathers stood for and use these numerals in its day to day correspondence, and MHRD does not encourage students to use them, then why will the people use these indigenous numerals. As an Indian, it is so embarrassing to watch the so called Hindi News channels which don't even use Devnagri numerals and still have an audacity to call themselves "the best Hindi channel". The Government of India and MHRD have a constitutional duty to encourage and, if necessary, enforce people to use Devnagri numerals. Sanskrit is deemed to be the language of future for futuristic computers by no less than NASA. Please read these eye-opening articles NASA to echo Sanskrit in space, website confirms its Mission Sanskrit and Sanskrit & Artificial Intelligence. Bharat is one of the oldest and richest civilizations in the world. It is home to the world's first planned cities, where every house had its own bathroom and toilet five thousand years ago. The Ancient Indians, our great ancestors, have not only given us Yog, Meditation and Ayurvedic medicines, but they have furthered our knowledge of science, maths - and inventedChaturanga, which became the game of chess. According to Albert Einstein, Ancient Indians "taught us how to count", as they invented the numbers 1-9 and 'zero', without which there would be no computers or digital age. Unfairly we still call this system of counting Arabic numbers - a misplaced credit. Two thousand years ago, we, the Indians pioneered plastic surgery, reconstructing the noses and ears on the faces of people who had been disfigured through punishment or warfare. Our ancestors performed eye operations such as cataract removal and invented inoculation to protect their population from Smallpox, saving thousands of lives. Before I finish this letter, I would like to remind you that one cannot build strong proud future by discounting and dismantling ones rich heritage. Devnagri is the soul of India, please don't scorn on it. Maharishi Shri Panini ji gave us this great language Sanskrit and its grammar. Maharishi Shri Ved Vyas ji, also known as Father of Ancient India, used Devnagri and Sanskrit to give us our great scriptures, and our Republic's Founding Fathers reinforced our aeons old nation's faith in preservation and promotion of the use of Devnagri numerals. It is our humble request to you that please do not deny our future generations the benefits and knowledge of this ancient heritage, which may be tens of thousands centuries old but is still as advanced as any other modern science known to mankind. Please continue with the use of Devnagri numerals in our Education system, and revise that imprudent and gratuitous proposal of your Ministry. भूमापन सारणी : महाराष्ट्र में भूमि का मापन कैसे होता है ?